Make managing multiple sites easy! 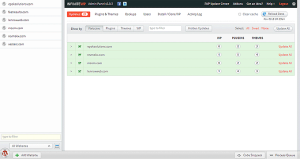 From there, you can manage all of your sites with a few clicks. It is a lesson in efficiency. Core update functionality is included free. Various addons provide additional features for power users. If you hire us to host an install of InfiniteWP, we will cover the cost of addons if you pay for annual hosting. Just let us know which addons are of interest to you. If you would like to have us install, configure and host InfiniteWP for you, please contact us, and we will get back to you with the details.